Sorry it's taken me so long to write this. I started teaching summer school this week and it's been a bit crazy getting the summer program together. 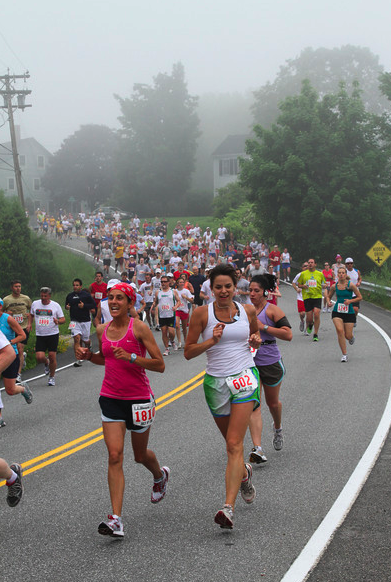 On Monday, we ran the LL Bean 4th of July 10K. When I say we, I mean a whole big group of us! The guys pushed the daughters in the joggers, while Jill, Jess, Stacy and I ran the race. We also met up with some other great running friends: Dan and his daughters, Mark and Christine, Kari, and Karen. I got to meet Carrie. Way to go on your race, Carrie! And I got to see Sarah. Sarah is healing from surgery right now, but she and her cute family came to cheer on her friends! What a trooper! 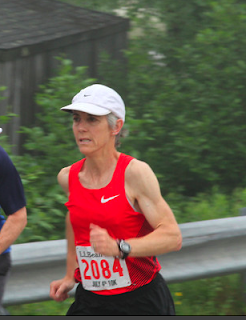 As many of you know, Freeport is home to Joan Samuelson - just one of the greatest runners of all time! Naturally, she runs this race. I normally don't get to see during the race but I did catch a glimpse of her during her warm up. 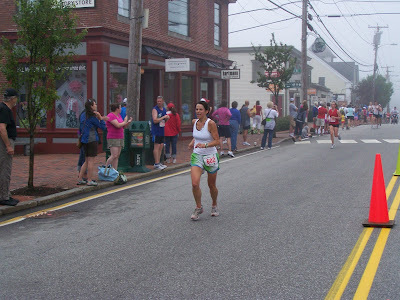 Here's a picture of her at about mile 1. She is a total inspiration to me. Back to the race. The race caps out at 1500. When I checked the website last week, I saw that over 1300 people had registered already. However, when I checked the results online, there were 1262 “finishers”. The forecast was calling for HOT and humid. I am thankful that it was still a bit foggy at the start. The humidity was a killer, but I was totally prepared for that. I hydrated myself very well on Sunday and then drank an entire 32 oz Nalgene bottle in before leaving the house. A few minutes before the race was to start, Jess and I got as far front/left as we could. Jill and Stacy went to their spots and Ward, Wade and Joe went to the far back with the strollers. A few minutes later, I thought I heard some mumbling and the maybe the National Anthem - there were a lot of people and then I heard the bang. This time it seemed like everyone was ready for the race, completely unlike the half marathon last week! I even had my own cheering crew/photographer - my dad showed up again! There was not an official start mat - but I KNOW I'm not going to win this race, it's all about my own self improvement, so instead of starting my Garmin at the gun, I waited until I crossed the starting line. Some people may disagree with me here, but I totally believe in net time for personal improvements. 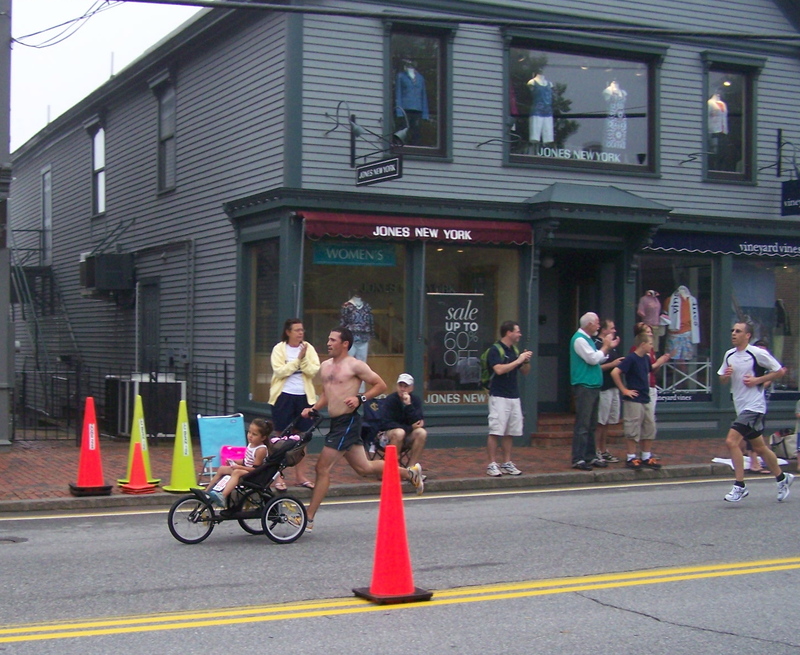 Especially when it takes nearly a minute to get to the starting line, like in this case. The race started out terribly congested. It was hard to get to my comfortable pace and to stay with Jess. We were weaving in and out of people like mad. That's just how it goes when you run a bigger race! In years past, Ward has passed me around mile 1. I kept saying to Jess, "where's the guys? they should have passed us by now!" The finally, we heard Wade coming from behind shouting our names! That's always an awesome feeling. Then came Mark, Ward, and Joe. Those guys just rock. 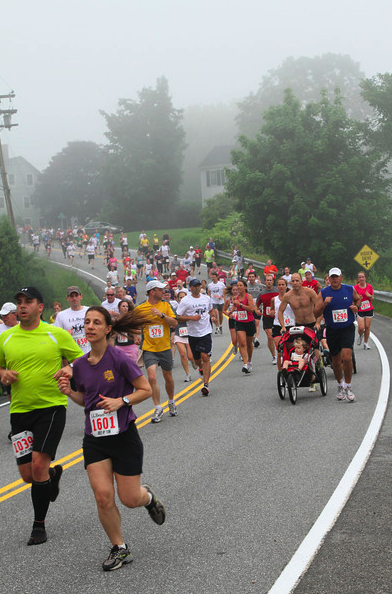 They started at the back of the race and passed over 1100 people. How incredible is that? I don't think those guys are very impressed with Ward passing them pushing a jogger! Anyway, basically, this course is a hard one. It's crazy hilly. Around mile 4, Jess and I caught up to Christine. I love it when I find Christine in races. My time last year was 53:57. Since I am just coming off of running a PR 1/2 marathon, my goal was to improve upon my last year's time for this course and to not necessarily PR. (I'm hoping for a PR at the Beach to Beacon one month from today!!!) My Garmin time said 50:29 (exactly 1 minute shy of my current B2B PR) and my official posted time was 51:08. I'll take the improvement and I will definitely be working harder now to improve my B2B time. I know I can! All in all, I enjoy this race and will probably end up spending many more 4th of July's running this race! Great pictures! 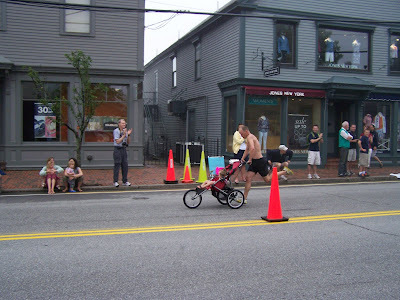 I think your dad should give my husband pointers on taking race pictures. Haha! I completely agree with you on starting your watch/Garmin on the actual starting line. See you in a month! P.S. Thanks for the link to my blog! Nice job on the run and yay for getting a picture of Joan!